Private Pleasures Game will offer you a great sexual game, which will turn your bedroom into a fireplace, full of spectacular orgasms and delightful atmosphere. Try to dare to imagine this sexual adventure, full of surprises, always charged with improving orgasms. Buy Private Pleasures Game from SexToys123 and get free discreet delivery on all orders over £30. Creative Conceptions are a UK based distributor and manufacturer of adult games and novelties. 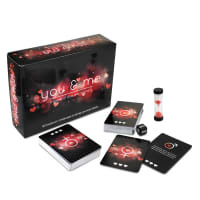 They have created some of the most popular adult board games including Monogamy range and Sexopoly.